This appendix looks to construct a basic historical understanding of the ancient cities of of Pompeii and Herculaneum. More acutely, this collection of historical, literary, and media materials strives to document the devastating eruption of Mount Vesuvius in AD 79 that wiped out the vast majority of a civilization. In order to do this, the appendix blends together documents from the ancient past, from the time Hemans was writing & publishing “The Image in Lava,” and representations of the place today. 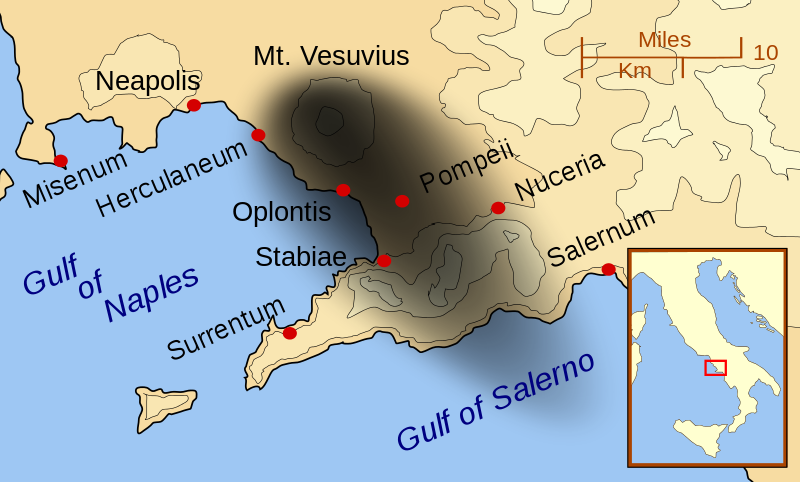 The map below shows the relative destruction and reach of the volcanic explosion. Fortunate for us as scholars of history and literature, we possess a written, eyewitness account of the eruption of Mount Vesuivus: “A young man named Pliny (the Younger), later a famous writer, was staying in his family home near Cape Misenum at the north of the Bay of Naples, about 30 km (19 miles) to the west of Vesuvius” (Roberts 279). To check out some of these fascinating letters, click here. This excerpt was taken from Murray’s Handbook for Travellers in Southern Italy (1853). Murray’s handbook was a medium for engagement and interpretation of historical spaces during the Victorian period (Beard 23). Murray’s entry on Pompeii and Herculaneum spans approximately 85 pages – making it a significant and noteworthy portion of the travel guide. In this entry, tourists would find travel itineraries, historic details, and information on the must see sites in Pompeii and Herculaneum.